RALEIGH, N.C. (AP) — The Carolina Hurricanes waited 10 long years to finally bring the playoffs back to town. They almost seemed determined to cram a decade’s worth of goals and hits into one game. Svechnikov was one of two Carolina forwards to sustain upper-body injuries in the first 10 minutes — physical winger Micheal Ferland was hurt about 2 minutes earlier — and that left the Hurricanes’ bench short for the final 2½ periods. There was nothing at all wrong with Foegele, who had his team’s first two-goal postseason game since Eric Staal in Game 4 against Boston in the second round in 2009. 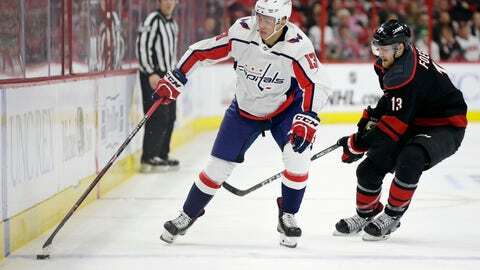 Foegele had a breakaway late in the second with a chance at the first postseason hat trick in club history, but Holtby stopped him — and then the rookie earned a slashing penalty for whacking the goalie’s chest and pads while reaching for the rebound. NOTES: Foegele’s only other two-goal game in the NHL came in the third game of the regular season, an 8-5 win over the New York Rangers on Oct. 7. … The Capitals had just one shot on goal in the second period. … This was Carolina’s first postseason victory since May 14, 2009, when Scott Walker scored in overtime of Game 7 against Boston.